The Roos had a job to do, and they did it. A straight sets exit wasn’t an option. Caloundra was definitely up for the fight, especially in the first half, but Maroochydore put the foot down in the third. They kicked six goals to one for the quarter, showing why they have been the team to beat all year. Caloundra had a crack in the last, but they were too far back. Paul Bevan finished with five, and Dzufer had it on a string. There is just no way these two teams will be involved in a blow out. Every time they play it’s close, and we love it. Like the last time they played, Coorparoo got the jump early. This time, they were able to hold on. The Pumas came at them late, but the Kings were able to ice the game, book a spot in the Grand Final, and kick their feet up for a week. Springwood face Bond this Saturday in a prelim. I wrote on Friday that they may be young, but Bond knows how to win them. That rang true on Saturday afternoon, because when the game was in the balance, the Sharks stepped up. Both were a little wasteful in front of goal, but that spoke more about the pressure than anything else. There was only two-points in it at the last break. Merrett and Sheehan kicked the first two of the quarter to give Bond a seven-point lead, but a Glenn Boyd response brought it back to a point. Like he has done all year, Ben Merrett stepped up when it counted, icing the game at the 24-minute mark, booking the Sharks into a prelim final this weekend. The Suns jumped the Lions, and that proved to be the difference. By half time, they had opened up a nine-goal advantage. You don’t lose too many finals with that type of lead. Kedron came back late, having a dip in the last quarter, but the sting was out of the game… the Suns were home. Going to be hard to beat, this year. Park Ridge needed to respond this week, and they did. It wasn’t easy though. At quarter time, they found themselves two goals down, and chasing tail. But to their credit, they chipped away, before edging ahead in the second half. Pine Rivers were close, and played some good footy early, but the Pirates found another gear after the long break. It also helps when Cherry pops up with six majors. They have another crack at Kedron this week. 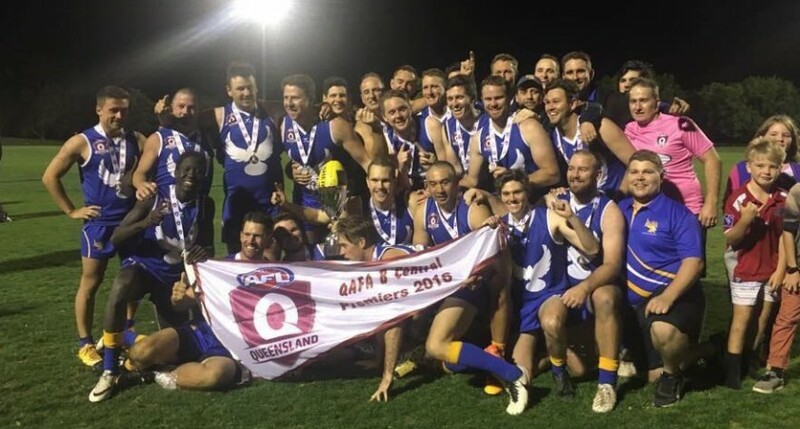 Zillmere are the 2016 QAFA (B) Central Premiers. Byron has put the disappointment of 2015 behind them, taking out the 2016 QAFA Northern Rivers premiership. Once they opened up a 26-point lead by quarter time, they hand one hand on the cup, and they weren’t letting that slip. They controlled the tempo, kept the Bombers in check, and made sure of the result. Ballina kicked the first of the last quarter to breathe a bit of life into the contest, but the Magpies slammed on the next three to put it to bed. Yeronga made their move in the second quarter, and that proved to be the difference in the end. The 20-point lead they gained was pretty much maintained for the rest of the afternoon, as they ran out 16-point winners at the final siren. Wendy Ng kicked four, and Caitlin Collins was outstanding with the footy. If this was the Grand Final preview, Maroochydore should be quietly confident. They were just too good for Jindalee on Saturday, all over the ground. When they had the momentum, they made sure they put it on the scoreboard, and they kicked straight as well. They go straight through to the Grand Final, while Jindalee take on Yeronga this weekend. It was a slow start for both sides, but once the wheels got turning, Maroochydore were never losing this. The Roos were slick on the outside, but also up in the contested stats. Half way through the last quarter, the game was iced. The Magpies kicked the last two, but the deficit was too great, the Roos are off to the big dance. Maroochydore just became the premiership favorites. The Sharks have become the first team to beat Mt Gravatt in 2016, and what a time to do it. Southport were previously the team that had come closest to knocking off the Vultures this year, but I don’t think many predicted this happening. The Sharks found themselves up by a solitary point at the final break, but turned it on in the last quarter. They kicked the last six goals of the game to storm into a Grand Final this week against Maroochydore. They ran hard, they linked up, and they played for each other. It was a final quarter performance that put a smile on any neutral observers face. Noosa ran riot on Saturday, putting together four quarters of blistering footy to book a Grand Final birth against Palm Beach this weekend. From the opening bounce, they were on. They extended their lead at every single break before storming home to a 103-point win. If you’re looking for the best way to boost your confidence heading into the biggest game of the year, here it is.